I am writing a little note again to tell you that I was at the gentleman whom the Arab Jew in Tartarin calls “le Zouge de paix.” Anyway, I got back 12 francs, and my landlord was reprimanded for having kept my trunk, since I did not refuse to pay, he had no right to keep it from me. If he had won his case, it would have been harmful to me, for he would not have failed to tell everyone that I could not or did not want to pay, and that he had been obliged to keep my trunk. Whereas now - for I left at the same time as he did - he said in the street that he had been angry, but that he had not meant to insult me. I think myself that this was probably just what he was trying to do, and seeing that I had had enough of his dump and that he could not force me to stay, he would have tried to blacken my reputation here. Very good. If I had wanted to get what is probably the fair reduction, I ought to have claimed more, for example for damages. If I let myself be had by the first comer here, you can imagine that soon I should not know where to turn. I have found a better restaurant where I can eat for 1 franc. I am in better health now. Just now I have two new studies like these: you already have a drawing like of one of them, of a farm by the high road among cornfields. A meadow full of very yellow buttercups, a ditch with iris plants with green leaves and purple flowers, the town in the background, a few gray willows - a strip of blue sky. If they don't mow the meadow I'd like to do this study again, for the subject was very beautiful, and I had some trouble finding the composition. A little town surrounded by fields completely blooming with yellow and purple flowers; you know, it is a beautiful Japanese dream. I asked the cost of carriage for the consignment I sent by goods train, it will be 7 francs to the station in Paris. Seeing that I haven't much left, I did not pay in advance here, but if they ask more you must protest; the case is marked VV&W. 1042. Yesterday and today we have the mistral again. I hope that my shipment will arrive before Tersteeg comes to Paris. With a handshake, write me soon. Vincent van Gogh. Letter to Theo van Gogh. 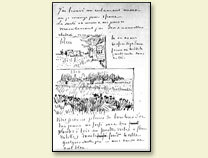 Written 12 May 1888 in Arles. Translated by Robert Harrison, edited by Robert Harrison, number 487.